DENVER, June 6, 2018 /Christian Newswire/ -- In Great Connections: Loving With Limits, the reader will learn how to develop relationships that balance our connection with others while living independent lives not controlled by others. The author, Larry D. Ellis, presents fascinating case studies and analyzes a number of biblical characters who demonstrate either healthy or dysfunctional behaviors. You will discover many Bible characters who established clear personal boundaries and lived by then. From a decidedly Christian worldview, the author looks to meaningful tools of psychology and important teachings from the Scriptures that explain how to make wise choices and enjoy healthy connected relationships. Dr. Ellis is a author and Bible teacher and has a masters and doctorate from the Robert E. Webber Institute for Worship Studies. He has served in churches for over forty years. Great Connections is available in soft cover and Kindle editions. Early praise for Great Connections - While we all desire loving and healthy family relationships, we must also acknowledge that these fragile bonds can be marred with control and boundary issues. 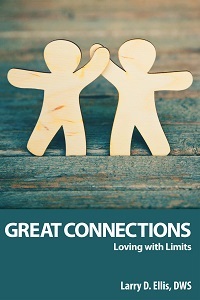 Great Connections: Loving with Limits is a must-read, not only for those who struggle with these dysfunctional connections, but also those with friends and loved ones who are affected by the consequences. Accessible, with interesting case studies and presented with a Christian worldview, Great Connections will leave the reader with a better understanding of how one can take personal responsibility to improve their own lives, as well as their individual family ties. -- Laurie Cockerell, former teacher, adoption caseworker, and the author of a number of children's books.